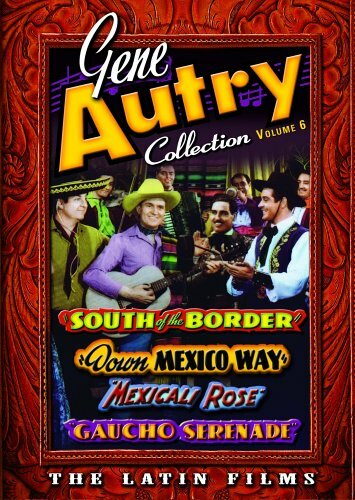 This special collection includes: South of the Border, Down Mexico Way, Mexicali Rose, and Gaucho Serenade South of the Border:On the eve of World War II, federal agents Gene Autry and Smiley Burnette are sent South of the Border to help foil the plans of foreign spies attempting to gain control of Mexican oil fields. Full of action, humor and music, this 1939 release introduced both the title song and teen performer Mary Lee to movie audiences. Down Mexico Way: When crooked film producers fleece the citizens of Sage City, Gene and Frog chase the con-men to Mexico. Once there, they must prevent the evil producers from swindling a wealthy Mexican rancher and his beautiful daughter and expose the filmmakers for the schemers they are. Fay McKenzie makes her film debut in this lavishly produced musical Western. Mexicali Rose: Hired as a radio singer, singing cowboy Gene Autry soon discovers the show's sponsor is a crooked oil company cheating, among others, an orphanage on the Mexican border. With the aid of a music-loving bandit, Gene and Smiley Burnette ride to the rescue. Spine-tingling thrills, breath-taking action, and heart-warming songs are all rolled into this great western adventure! Gaucho Serenade: Dust off your cowboy hat and polish your spurs as America's first and favorite singing cowboy gallops across the silver screen into your living room! A case of mistaken identity sends down and out rodeo stars Gene Autry and Frog on a rip-roaring, cross-country trek as they help a little boy evade the gangsters responsible for the false imprisonment of his father. Also features Duncan Renaldo (TV's popular Cisco Kid) and classic tunes including "A Song at Sunset."